Many “import” cars of importance these days are made in the U.S.—BMW, Mercedes, Honda, Volvo, Kia, Nissan, Subaru, Hyundai all have huge operations here. That also includes Toyota, which announced today it’d be investing even more in its already substantial U.S. production facilities. In a time when American automakers are shifting jobs elsewhere—GM, for example, just closed down its Lordstown, Ohio, assembly facility because it can make the Chevy Cruze at a lower cost in Mexico and overseas—foreign automakers are investing big in its U.S. operations. Even little Volvo, for example, opened a new plant in South Carolina last year. 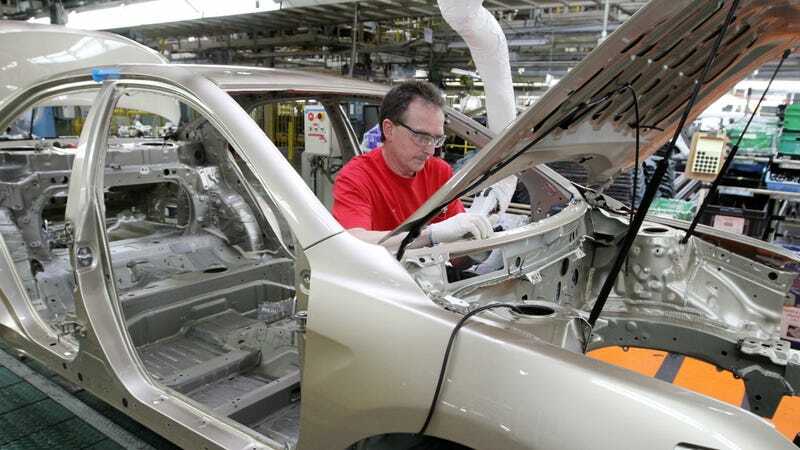 The automaker plans to increase engine capacity in Alabama, add production of the RAV4 hybrid and Lexus ES 300h hybrid in Kentucky, and double hybrid transaxle capacity in West Virginia. It also plans to raise output of castings at plants operated by its Bodine Aluminum subsidiary in Tennessee and Missouri. How to explain the discrepancy, i.e. foreign automakers coming here and American automakers seemingly leaving? Well, the locations of where all the foreign investments should give you a hint. Alabama, Kentucky, West Virginia, Tennessee, and Missouri are all right-to-work states. Maybe even more importantly, none of the foreign automakers operating in the U.S. are unionized. No union means cheaper labor, which makes sense as a cold business decision but is a bad deal for workers. (I could argue that a better deal for workers is a better deal for business, but that’s a discussion for a different blog.) Unionize your workplace, if you can!